Nestlé UK & Ireland is the first major confectionery company to source 100% certified sustainable cocoa in the UK and Ireland. Throughout 2016 Nestlé been running a successful campaign in the UK, promoting the Nestlé Cocoa Plan to consumers. 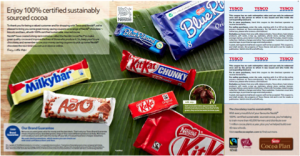 Stephanie Scales, Brand Manager: KITKAT and Biscuits, told us how taking a targeted approach, making its sustainability messages brand relevant and partnering with retailers has been key to success. We worked hard to make the messages really relevant to the consumer’s experience of our brands, for example, by explaining how sustainable sourcing can help to improve the quality of the final product. The results are still being analyzed but the feedback is positive. “We actively engaged thousands of consumers on our sustainability work. 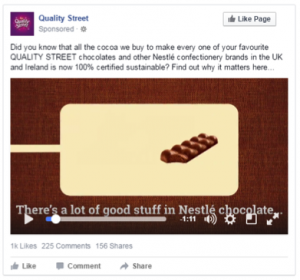 We found that consumers were receptive and were pleased to find out about the good things happening through the Nestlé Cocoa Plan,” says Stephanie. Key to the success of the campaign was a partnership with retailers Tesco, Asda, Morrisons and the Coop including in-store promotions and events, online banners, mailings to loyalty card customers and features in the retailers’ magazines. Partnering with our retailers has been very important. We linked our campaign to their marketing agendas and worked together to tell the story of responsible sourcing. This has made it more accessible and relevant to consumers. The campaign had two distinct phases. 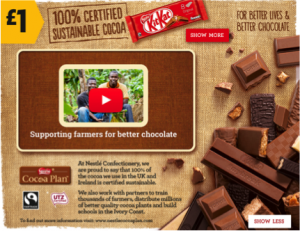 For phase one, Nestlé gave people information on the Nestlé Cocoa Plan through advertising on public transport and in Sunday newspapers, an animated infographic on social media and an employee engagement element. Phase two included the retail partnerships. We kept coming with new messages and channels throughout the year, telling the story in slightly different ways and from different perspectives. Nestlé worked with UTZ on developing the campaign. “Working with UTZ gave us an external lens and helped us to develop the right language and tone for the campaign, as well as giving it extra credibility for consumers.” says Stephanie. Planning your own sustainability campaign? Get in touch and find out how we can support! UTZ explained by children. The new ALDI SÜD sustainability campaign.